Super Sunday brings the biggest game between Everton and Tottenham Hotspur in a Premier League gameweek 20 at Goodison Park. Boss Roberto Martinez will have to play without midfielder James McCarthy who picked up a groin injury in last game against Stoke City. Tom Cleverley is also out with a Achilles problem. Steven Pienaar, Bryan Oviedo and Tony Hibbert all remain on the sideline. Skipper Phil Jagielka is closing on return but still needs few weeks. Leighton Baines is expected to return to the starting eleven. Midfielder Mousa Dembele will miss this game due to an ankle injury which he suffered against Watford earlier this week. Boss Mauricio Pochettino confirmed that he will be out for few weeks. Alex Pritchard and Clinton N'Jie both remain on the sideline through injury. 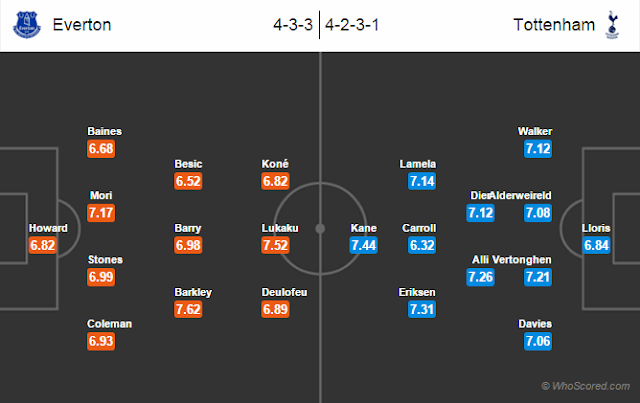 Christian Eriksen and Kyle Walker are expected to return to the lineup. Tom Carroll could be starting this game after his wonderful performance in last game. Spurs are unbeaten in 17 of their last 18 Premier League games. Tottenham have not lost any of their last six games against Everton in all campaigns. Spurs have kept three clean sheets in last four wins against Everton in Premier League. Everton have lost only one of their last eight home games against Spurs in Premier League. Everton 1 – 1 Tottenham, Harry Kane on the score sheet for the away side.